The versatility of wound healing and anti-inflammatory agents can be assets to dermatologists when other therapies lack appropriate mechanisms of action, or when the risk to benefit ratio may be in question. Bensal HP ointment is a broad-spectrum antimicrobial agent with in vitro activity against important pathogens such as MRSA and gram-negative bacteria, some fungal strains, and yeasts.1 Based on the physiochemical composition of Bensal HP ointment, and its impact after application to skin, there are many potentially benefits derived from the formulation stability. While there have been several animal and human studies characterizing the antibacterial, wound healing, and anti-inflammatory properties of Bensal HP, they do not provide real world clinical experience and guidance on potential utilization in dermatology. The goal of this article is to present a variety of clinical cases for which Bensal HP was utilized as a means of translating the pre-clinical and trial data. J Drugs Dermatol. 2019;18(2):203-206. As concerns for antibiotic resistance lead to calls for stewardship, and negative perceptions of steroids by patients influence treatment options, there is a growing interest in "natural" or alternative approaches to therapy. At the same time, the active ingredients, vehicles, excipients, and mechanisms of action must be regularly evaluated for efficacy. Safer options for open wounds and more delicate locations such as intertriginous areas of the body, and as adjuvants to other treatments are in higher demand as patients continue to gain more interest in their options. Traditional applications for benzoic acid, salicylic acid, and other anti-inflammatory agents that once were limited to acne and keratolysis are now expanding into areas such as wound healing where effective treatment options have been sparse.1The pairing of the following cases with preclinical/clinical data will marry anecdote to evidence in order to provide a practical rationale for therapy. HistoryThis 47-year-old otherwise healthy male underwent an excision of a large asymptomatic lipoma on the posterior neck with primary closure (Figure 1A). Unfortunately, wound care in the area was difficult to execute by himself and the health of wound with sutures intact became compromised. 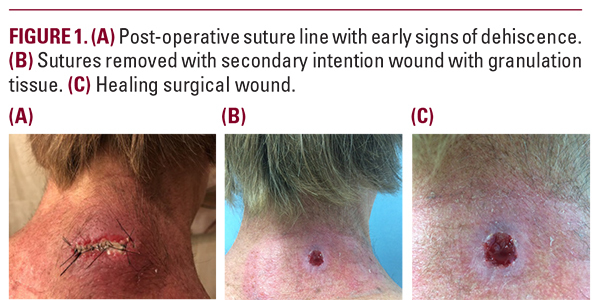 Due to the range of motion involved in the area, closure was compromised, and the wound dehisced resulting in management by secondary intention (Figures 1B and 1C).